Back from my CNY holiday!! Was on semi-holiday since market re-open after CNY holiday on Feb13. Since the wide range day on Feb13 upon market re-open after long holidays, price had been stuck in a consolidation ranged 10-15pts for the past few days, which saw 4 consecutive red candles on a downward slope, including today's. 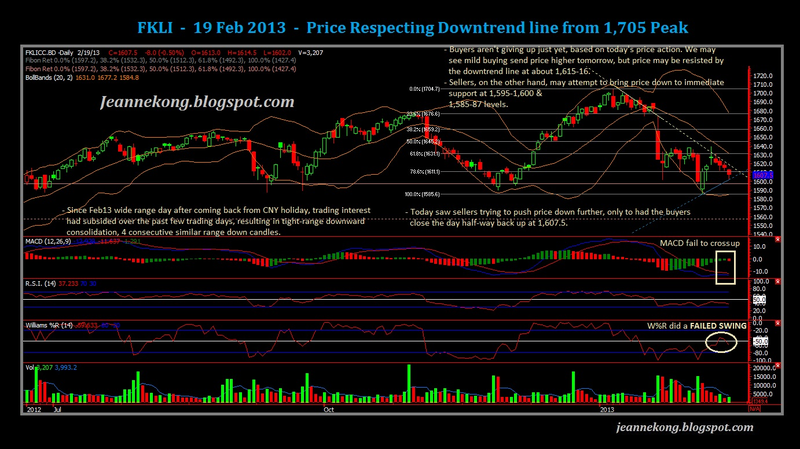 A check on the last 4 daily candles shows that they are actually strongly resisted by the downtrend line from 1,705 peak. An MACD crossover almost occurred before today's down day, which may have tricked some eager buyers into action. By end of the day, its pretty obvious that the crossover will not be happening as the two MAs diverge further to the downside. I was expecting a more furious drop today but it seems that buyers are still not giving up yet. 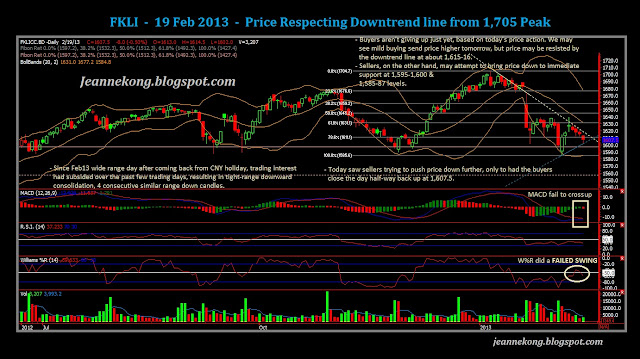 They managed to take over & push price to close higher at 1,607.5, near middle of the day's range. We may see the buying interest spill over to tomorrow's session, but sellers may not easily give way to any rise, too, I supposed. Thus, there may well be some indecision tomorrow, barring any unforeseen breakouts from either sides at the open. Resistance lies at 1,612.5 (past days consolidation bottom), 1,615-16 level where the downtrend line extends to, & further up at 1,621.5-25 | 1,630-32 | 1,640 levels, respectively. 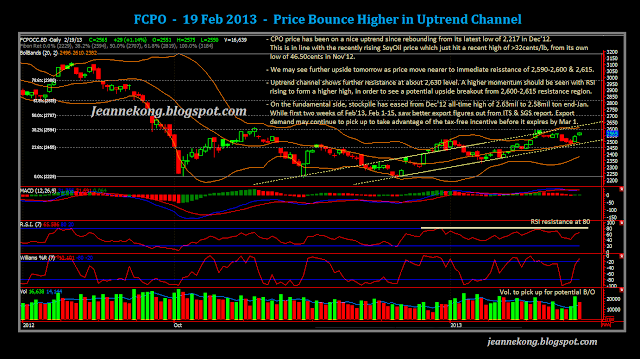 CPO has been on a graceful upward climb since the last pivot low at 2,217 mid Dec'12. 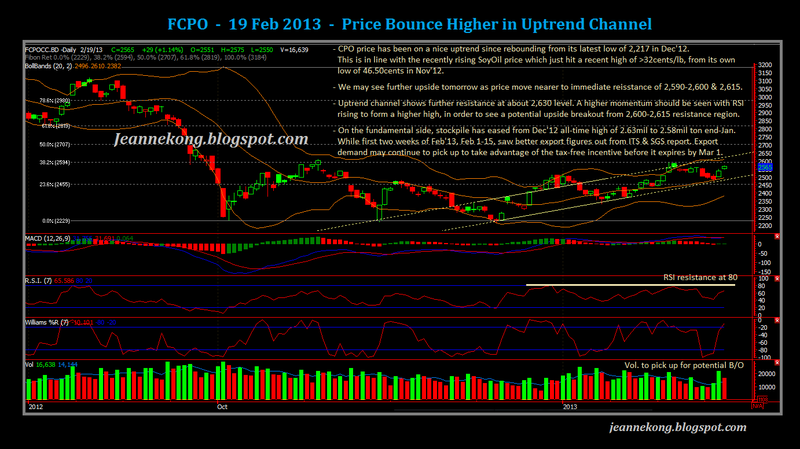 Price rise along an uptrend channel of about 130pts, with the latest higher low formed at 2,476 level. Today saw price open gap up above the 2,550 resistance level, & subsequently close the day up at 2,565, hitting an intraday high of 2,575. Price has successfully breakout from the downward bias induced by the temporary pullback from 2,592-2,476. Managed a stay within the mid-term uptrend channel. Based on the uptrend channel, resistance comes in at 2,630 overhead. However, price has to break the strong psychological resistance of 2,600-2,615, before it can rise further up. Immediate resistance comes in at 2,590 level. Favorable fundamental data is also backing the climb in price. End-Jan stockpile eased to 2.58mil ton, from an all-time high of 2.63mil recorded in Dec'12. Export demand has been on a rising trend from Feb1-15, as reported by ITS & SGS. The reinstatement of CPO export tax of 4.5% effective Mar1 may stir some concerns among the bulls. However, the immediate effect may be a rise in export demand for Feb'13 as importers take full advantage of the duty-free exports before it lapses. 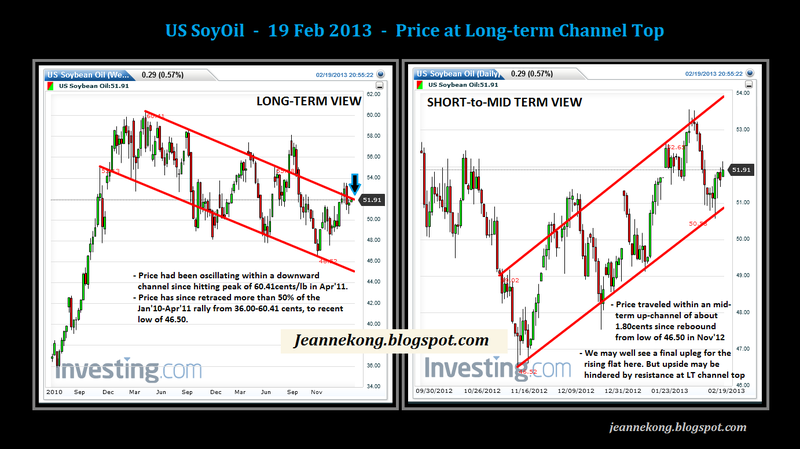 Rising SoyOil price is yet another cheerleader for the bulls' camp. Price has been rising steadily in an up-channel since Nov'12. 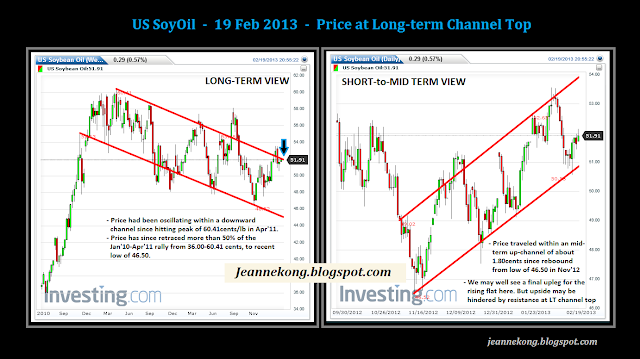 However, note that price has also hit the long-term downward consolidation channel top at around 51.90cents. On the short-term, we may see another upleg to test the ST up-channel top. But price may have to overcome strong resistance to breakout to the upside, continuing the uptrend. That ends my first serious post after coming back from CNY holiday mood.